Purim, a Jewish holiday with lots of 21st century appeal, begins at sundown this Saturday night. It's a story of a king's love of a beautiful and wise woman (Esther), the wisdom and strength of her relative Mordecai and the evil machinations of the royal advisor Haman and how he is foiled in his plot to destroy the Jews in ancient Persia. Oh, and a queen (Vashti) who stood up for herself and is now seen by some as unjustly punished and a early progenitor of woman's rights. You can read more about this holiday and the traditions associated with it here (from a very traditional resource so not so much on that women's rights angle, but lots of good info and recipes). One of the ways the holiday is celebrated is with public reading of the Book of Esther, or the "Megillah," which has become slang for telling someone the whole story. Whenever Haman's name is mentioned in the story, the listeners stamp their feet, shake noisemakers and generally try to make sure the name can not be heard. Another tradition is to give gifts of food to friends as well as the less fortunate. A third way the holiday is celebrated is for children (and many adults) to get dressed up as either the main characters in the story or in any other fanciful getup they choose. Another tradition is to enjoy spirits. It's quite a site to see your fellow congregants dressed up in queenly regalia (sometimes even the men) as Esther or dressed as some ancient Persian might be in robes and fake beards (sometimes even the women) passing a bottle of fine whiskey or throat-burning plum brandy (slivovitz) from hand to hand during the Megillah reading. 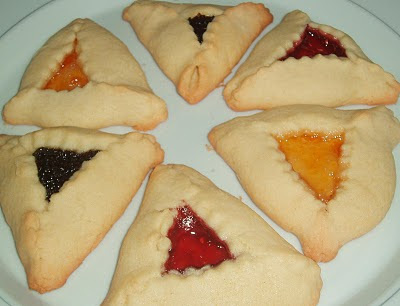 The most popular food of Purim are probably hamanstachen (see recipe below), the Ashkenazi cookie symbolizing Haman’s tri-cornered hat. But that’s not the whole “megillah;” there are many foods that add to a Purim celebration. Go sweet and sour. Sweet and sour foods suit the nature of the holiday, reminding us of the bitterness of Haman’s actions in trying to trick the king and harm the Jews and the redemption that followed. Bake challah (a rich egg bread) in triangular loaves to represent Haman’s ears. Use some of it to make French toast, known as Queen Esther’s Toast or Purim Fritters, once a popular way to celebrate Purim. I have links to challah recipes here and give my favorite French toast recipe here. Drink up. Rabbis have said that one should drink on Purim until one can’t distinguish the difference between “blessed is Mordecai” and “cursed is Haman.” Go with the flow. Splash some vodka or tequila into your chicken marinade. Add wine to your beef or fish recipes. Want to give it a try? Try my Limoncello Tuna or Martini Chicken recipes. Preheat oven to 350 degrees. In a large bowl, mix flour, baking powder and sugar. Cut in margarine. Add eggs and vanilla. Mix dough until it forms a ball. Add extra flour if necessary. On a floured board, roll out until ¼ thick and cut into circles using a cookie or biscuit cutter or the top of a drinking glass. Fill with jelly, pastry filling, or chocolate chips. Pinch up three sides to form triangles. Bake for 25-30 minutes. Note: You can substitute butter for the margarine. If you use a margarine without any dairy ingredients, this recipe would be "pareve" and therefore suitable to serve after a meal that contained meat. If it has any dairy ingredients, a Jew who observes the traditional dietary laws could not immediately eat it, hence the use of margarine in the preschool's recipe.